Before anything else, you must watch this amazing video that my new friend Laura (@SraSpanglish) posted during tonight’s #nced chat. It’s pure gold. Imagine… a Saturday (the only ick factor, but just wait for it and trust me) of free personalized, tailored PD where teachers of all grade levels, administration from schools and central offices, and you are on an equal playing field sharing information and asking questions without fear of judgment or failure. My first experience was at EdCampWNC held at NCCAT campus in Cullowhee, NC. A fellow media coordinator and great friend of mine, Rebecca (@RBennettSLM) and I made the 3-hour drive Friday evening so we would be ready to learn on Saturday. From the second I walked in, I met amazing new people and was reunited with great friends from college and graduate school. The very first friendly face I saw was the 2012-2013 NC Teacher of the Year, Darcy Grimes (@DarcyGrimesNC). She and I graduated from Appalachian State University together for our undergrad and were in the same block of classes together. I knew from that moment the rest of the day would be phenomenal! In the opening session, we were given a quick 5-10 minute keynote speech. It was amazing because, let’s be honest, after the first 10 minutes of a conference keynote, many of us are already looking at the schedule to plan the rest of our day and deciding on lunch plans. Then we were told the “Rules of EdCamp” such as the Rule of Two Feet, Be Selfish, and Talk about EdCamp. We created the sessions for the day right there… yes, we did – the participants. How cool is that?! If we wanted to learn about a topic, we entered into Google Moderator. If we saw a topic we were interested in discussing, we gave it a thumbs up and the top 16 topics for the day (4 sessions at each of 4 time slots for the day) were used to create our schedule. Now, for the most amazing part of EdCamp… we walked into our rooms… and we talked. All of us. There were educational conversations going on throughout the entire room, some side conversations, a collaborative Google Doc with additional conversation, as well as a discussion on Twitter. It was an immersion into all that is awesome about education. I attended sessions on Augmented Reality, Learning Spaces, MakerSpaces, and Game-Based Learning/Gamification. 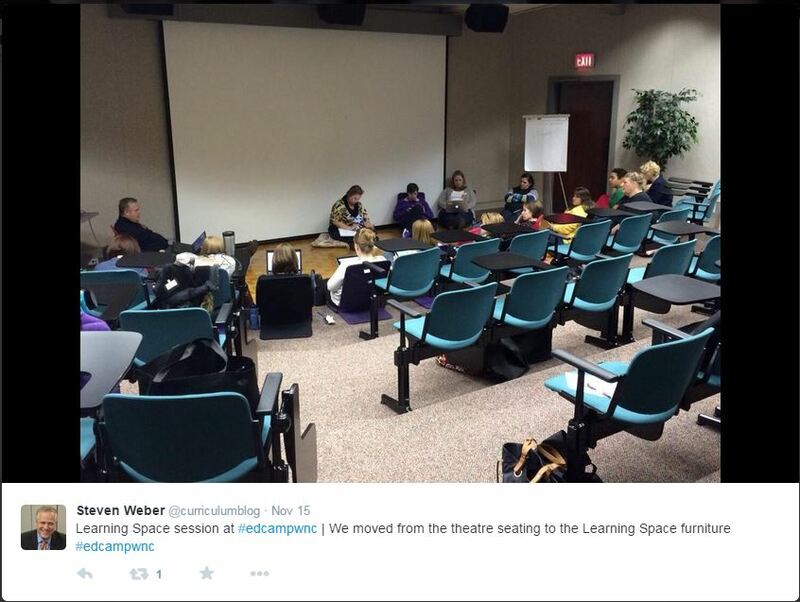 My favorite was Learning Spaces which became facilitated by Steven Weber (@curriculumblog); we walked into an amphitheater classroom and saw the immediate irony of discussing learning spaces in a space that was one of the worst learning spaces of all. Rather than sit in the seats, we all grabbed pillows and went to the bottom of the amphitheater and sat on the floor. The networking was insane. The validation was wonderful. The collaborative learning was exceptional. At 2:15 we gathered back in the main room for an App Smack-Down where participants showed off quick 2-3 minute snapshots of amazing apps or tech tools they use. Just that 30 minutes alone gave me more useful information than I’ve ever gained in a PD workshop. The final 15 minutes was door prizes. As fate would have it, I didn’t win anything; I rarely ever win anything. However, when I left, I felt like the biggest winner of the day. Rebecca and I talked the entire 3 hour drive back home about ideas we wanted to implement as soon as we got home. I loved EdCamp so much that I registered for four more within a couple of weeks. I will attend EdCampQC in Charlotte this weekend (look for future blog post about Saturday with words like amazing, incredible, stupendous… you get the point), EdCampRowan in Salisbury after NCTIES on March 7, EdCampWNC (Part 2) at NCCAT in Cullowhee in April and EdCampMaker at Elon in May. If you’ve never been to an EdCamp, you are missing out. Find one in your area and go! I’ve never heard of anyone saying that they thought EdCamp was horrible and a waste of time, so I feel certain you won’t regret it!